Have you heard of Fashion Formula? I hadn’t until they got in touch with me a couple months ago looking to collab on a project. They’re basically UK’s answer to Spoonflower, albeit at an early stage! Fashion Formula is based in north London and prints custom fabric, wallpaper and a few home items like cushions and aprons. You can pick prints designed by artists from their online store or you can design your own! If you’re a budding (or experienced, for that matter) designer you can also sell your designs on their website. A great idea for a little extra income! I tried my hand at designing a print. Disclaimer: I’m no artist but I felt it would be a great opportunity to give it a whirl! So I spent ages on Adobe Illustrator, playing around and working out how to do a repeating pattern. It was a lot of fun and I think I picked up a lot of new skills! I got it printed on scuba crepe. It’s got the thickness and stretch of a neoprene and the surface a surface texture like a crepe. It’s an interesting fabric! 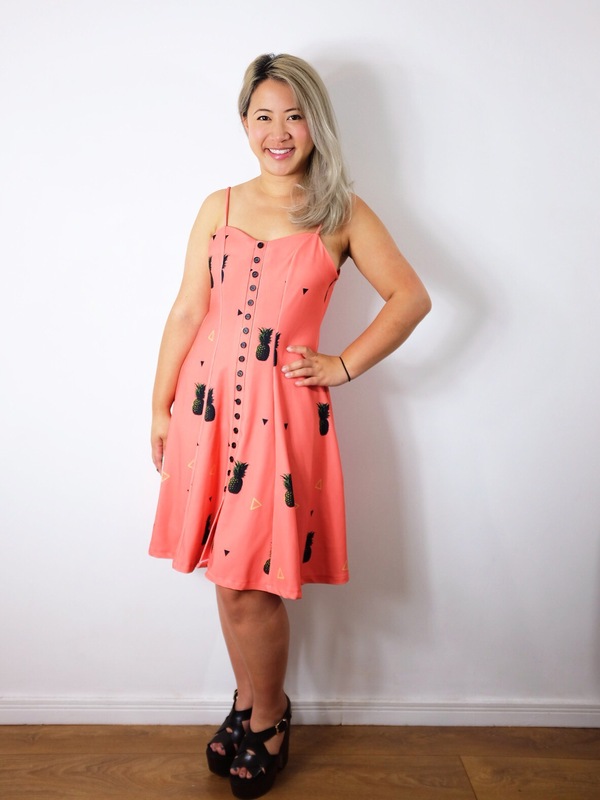 I used it to make the Sabrina dress (view B) from By Hand London. If anyone was watching on Instagram, I had attempted this pattern before but accidentally cut the wrong size! I wanted to give it another try and thought this fabric would give this 90s dress a really funky feel. 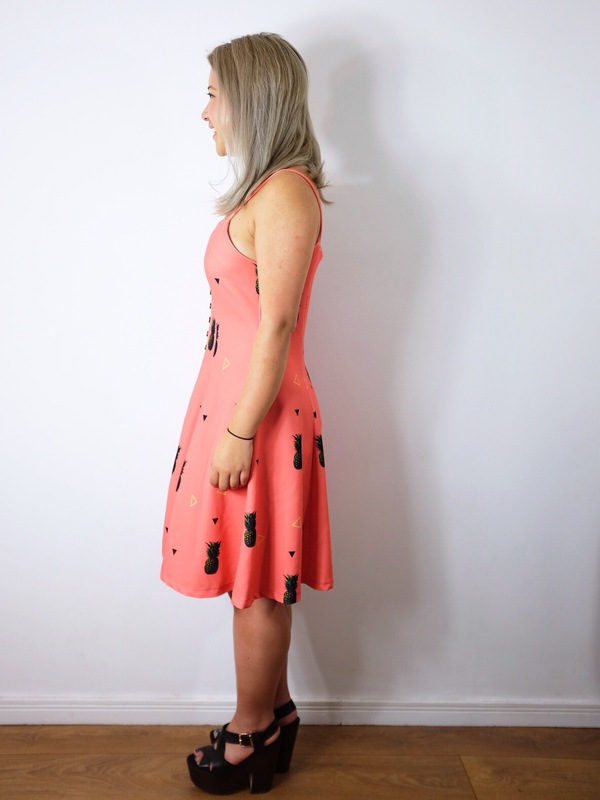 The fabric was really easy to sew up and the fit of the dress (now in the right size) was spot on! I flared out the skirt a little bit to give it more movement but otherwise kept it as is. It’s such a fun fabric and dress. I can’t wait to wear it all summer! Fashion Formula has really opened the door to endless fabric possibilities. I can’t wait to use their services again! That’s a fabulous print you’ve designed. It suits the dress and the dress suits you! A totally unique garment. Thank you! It’s nice knowing that it’s completely one of a kind! Lovely fabric! You wanted to choose patterns that suited you better – well that dress is fab on you, hope you don’t mind me saying it is really flattering. Thank you! I’m really happy with the style and fit of this dress. It’s definitely going to be one of my tried-and-true patterns so hopefully I’l have time to make a couple more this summer! Yep, it’s definitely unique! It’s great for making something really special!